Epoch Taste Features Chef Eric! It was an honor and a privilege to have Stephanie Chase, from The Epoch Taste visit us in the Culinary Classroom! 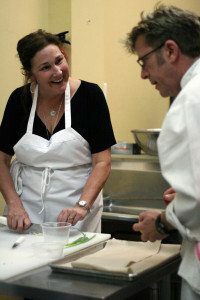 Stephanie took the time to attend our 4-week Culinary Basics Class, and then did us the honor of writing an extraordinary post about our classes and her experience. During Stephanie’s time at the Culinary Classroom she was able to experience everything our students experience during their culinary adventure and we were thrilled to have her join us! “Chef Eric is fun and dynamic, and he’s passionate about food. His wife, Jennie, runs the business and is fun-loving and extremely friendly. You can take classes at every level, and can focus on a specialty if you desire. To read the full post visit Epoch Taste, and then take the time to view our upcoming classes and register for your spot today! And, if you have questions, please don’t hesitate to be in touch to learn more about maximizing your current culinary skills or simply getting started with the basics. It’s never been easier to learn to cook or take your skills to the next level with our specially designed classes. CHEF ERIC gave me the tools I needed to become a successful full-event caterer. CHEF ERIC‘s instruction and encouragement helped me embark on a new career path. I began training at the Culinary Institute of America and am thrilled with my decision. Chef Eric is so friendly and great with the kids. My 9 year old daughter couldn’t wait to go back to class the next day. I referred a friend of mine and her sister and niece to your school. They took your Chicken Connoisseur Class and loved it. I knew they would because your school is the best in Los Angeles. First I have to say how much fun Dina and I had at your Chicken Connoisseur class this past Friday. What a great class and the food was incredible. I had the best experience in this class, and Thank you Chef Eric for your teaching, support and enthusiasm. I have grown to know all of you as my friends, My Ohana, My family. I have never met a greater bunch of folks, I left each class smiling as a result of not only creating dishes, but because of the fun we had, the laughter. Absolutely Priceless.